On a predictably pleasant Sunday, twelve Germans descended upon Bangalore. 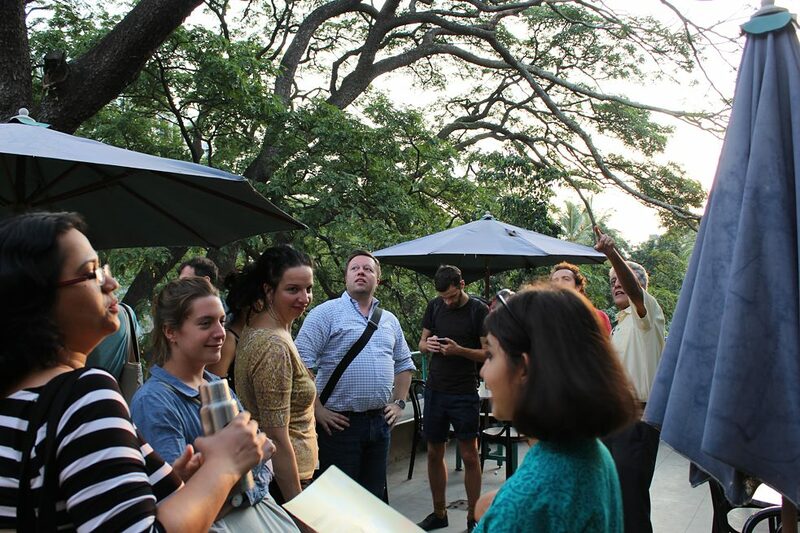 Jet-lagged and half-dazed, they trickled into the Goethe Institut / Max Mueller Bhavan to officially begin the bangaloREsidency 2018. Of course, auspicious beginnings must involve food. And our residents’ introduction to Bangalore was just that — a slow lunch at the Institute, getting to know each other and downing enough coffee to keep awake through what would be a packed first day! A tourist bus that showed up late because it lost its way carted the group to Attakkalari Centre for Movement Arts, one of the hosts of this year’s residency. Hemabharathy Palani, the rehearsal director of Attakkalari’s dance company, spoke to the residents about Attakkalari’s various dance and education programmes. The second-year students then demonstrated a few pieces, including one in the traditional martial art form, Kalaripayattu. Many of the residents seemed enthralled by the dancing. 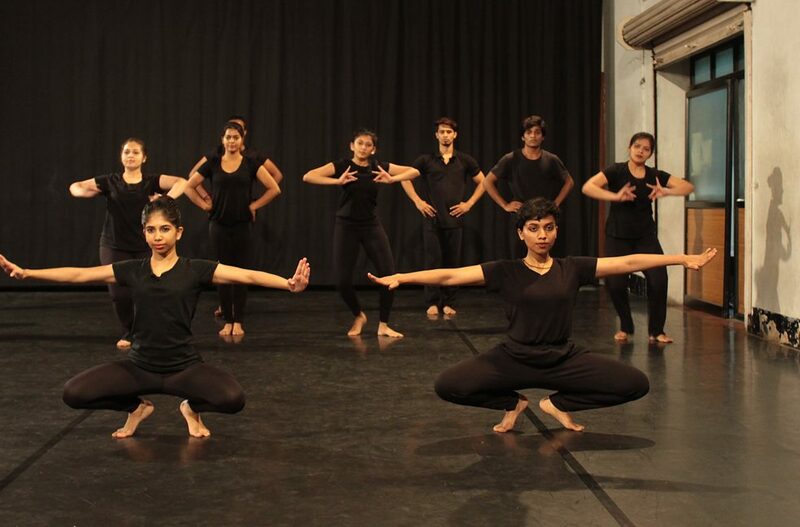 Nika Pfeifer, bangaloREsident@Srishti, said that the dance offered her a way to look at Bangalore as a city. The dancing got her interested in how ‘people communicate collectively’, even on the public street. ‘I noticed in Bangalore that in traffic people are still communicating with each other, looking out for each other… it’s a different kind of collective, it’s warm’. Attakkalari | Foto: Kerstin Meenen © Goethe-Institut Max Mueller Bhavan With a little time to spare before the next planned activity, the residents were whisked off on an impromptu walk in Lal Bagh, one the city’s most famous and oldest gardens. (Incidentally, Lal Bagh has its own German connection, having been designed by one Gustav Hermann Krumbiegel from Saxony.) Because it was a Sunday, our residents got to see Lal Bagh at its most crowded, though they were promised a quieter experience if they visited another day. Still, they managed to stroll by the famous glass house and bandstand, before ending the walk near a collection of garden statues inspired by Snow White and the Seven Dwarves—the bizarreness of that vision amused many. Then it was back to the bus and to Ravindra Kalakshetra, an old-time cultural centre in the middle of the city. Here, another bangaloREsidency host, Maraa, had organised the tenth edition of their October Jam. Themed ‘From the Gut’, the event stood in solidarity with artists around the country who have been censored and arrested. Walter Solon, a bangaloREsident originally from Brazil, was waiting for the election results that night. The political resonances in the poetry and speeches of the October Jam culminated for him a day of connections between the country he is from and the one he is visiting — from the broken sidewalks, to the stray dogs, to the brutal politics, he kept thinking of how similar the two places seemed. Following some music and poetry, everyone made their way to the final stop for the evening, 1 Shanthi Road Studio/Gallery. A long-time partner of the Goethe-Institut / Max Mueller Bhavan, Shanthi Road welcomed the residents with its famed homely hospitality. Chilled beer and fried nibbles awaited a very tired lot of residents, who were glad to finally get this time to unwind. Once everyone had been plied with food and drink, Suresh Jayaram, the founder of Shanthi Road gave a presentation on Bangalore’s past and present. From tidbits out of his family’s archive of the city, to colonial architecture, to must-see sites off the beaten path, Suresh’s wealth of insider scoop on Bangalore got the residents interested in different aspects of the city — environmental history, architecture, nightlife. By the end of the evening, Suresh had been inundated with requests for one of his much-praised Bangalore walks. The only condition he gave the sleepy residents before they left was — if they wanted to go on a walk with him, they had to wake up early. Two days after the first orientation, the entire group met once again at Daily Dump, which designs products to help better manage waste in urban homes. Founder Poonam Bir Kasturi led the group on a ‘trash trail’ around Indiranagar, explaining how waste is managed and mismanaged in the city. She showed them how garbage winds up on the streets in certain patterns, how it is collected, and laboriously separated by municipal workers. Trudging through flea-ridden piles of waste at the municipal dry waste collection centre, the residents got to see a side of Bangalore that is as real as its beautiful trees and lively pub culture. ‘It was a bit absurd to see trash in a new city. I could see trash anywhere’, said Ingo Gerken, bangaloREsident@1 Shanthi Road. ‘But then I realised that the trash is not the same and that European solutions to waste don’t work here… it was special to see that people are working on these problems. But it was trash… so it was also amusing’. 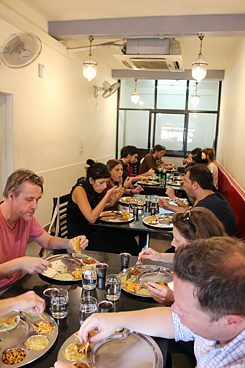 MTR Lunch | Foto: Liv Hunzinger © Goethe-Institut / Max Mueller Bhavan A traditional thaali lunch at MTR, a local eatery more than a century old, ticked off a must-do on everyone’s bucket list. The endless mounds of rice, served with a variety of side dishes of lentils and vegetables and curd left everyone feeling a little fuller than they would have liked. But they still managed to make it to an exhibition by local photographer, Sandeep TK, and a talk on the city by Naresh Narasimhan, who heads MOD Institute, another bangaloREsidency host. Two long orientation days finally came to a close at an ideal place — Ranga Shankara, Bangalore’s theatre hub. As is custom at Ranga Shankara, the residents ate sabudana vada (tapioca fritters) and drank filter coffee before standing in line for I am not here, a play on the censorship of women writers, by Deepika Arwind. The bangaloREsidents went home having seen a lot of Bangalore, and feeling, as is expected, only somewhat oriented.